I think we have talked about the way I pine for lazy weekend mornings to while away with plates of fresh muffins. A recent foray into vegan, gluten-free cooking (long story) left me with a sizeable quantity of almond milk and gluten-free all-purpose flour (“GF AP”). I didn’t have specific designs on them at first, but figured the inventive mood would strike at some point. One morning, it did. And here is where I confess something slightly embarrassing. I make biscuits with Bisquick. I know, I know. It’s rather antithetical to all of my feelings about baking. I’m wrapping myself in a little shower curtain of shame in order to explain this, but it’s relevant to the how and why I decided to try using almond milk in muffins, so stick with me. After months of enjoying the splendor of traditional baking powder biscuits made with butter, John and I decided to get back on Weight Watchers (a wagon from which we have long since fallen). After recommitting to the double-W, we couldn’t justify the eleventy vermillion points in a serving of those biscuits (vermillion is a number with so many zeroes it turns red). One day, I discovered that Bisquick’s Heart Healthy baking mix made decent, though not equivalent, biscuits. What can I say, they are incredibly fast and relatively low in calories and fat. Have I lost all baking credibility with you? I hope not. Remember the marshmallows? The bread? The olive oil cake? Surely you can cut me a smidgen of slack for this one thing. Oh, and if John tries to tell you about a bag of frozen potstickers that allegedly appears in our freezer on occasion, HE IS LYING. So. As I was saying, I had gobs of almond milk and GF AP and no plans for either. On a whim, I decided to see what would happen if I used almond milk in place of regular milk in my Bisquick biscuits. My reaction, upon opening the oven, summoned from my core an authentic, Utahn OH MY HECK that would have made Norm Bangerter proud. They were HUGE and had the most amazing texture – pillowy soft with the tiniest crumb. 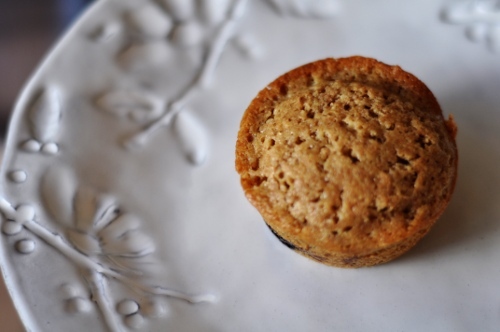 Since the basic muffin recipe is quick and quite malleable when it comes to ingredient manipulation, I decided to take the almond milk for another spin and see what it could do. When combined with GF AP, the result is scrumptious and workable for the gluten-free and dairy-free crowds (so long as your dairy-free parameters concern Things That Come From a Cow; the recipe includes eggs). Food allergy/intolerance struggles are near and dear to my little peanut-allergic heart. I’m pleased to offer this recipe for my gluten-free and dairy-free friends who yearn for baked things that don’t suffer in texture or taste. All too often, recipe adaptations for food allergies/intolerances are woeful approximations of the real thing. 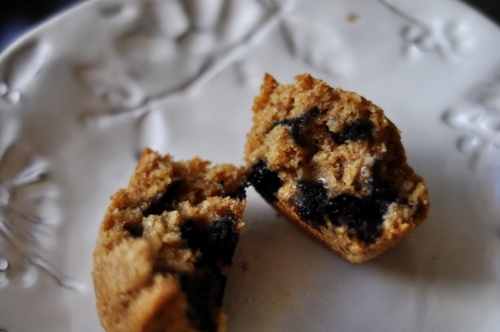 In tasting these muffins (and sharing them with my lovely, gluten-free neighbor), I was really heartened to see that they taste and feel like…muffins. They aren’t a weak knock-off, they’re just good. Give them a shot, whether or not you happen to have a hard time with gluten or milk proteins. You’ll have something wonderful to share with those who do. The blueberries get a subtle but beautiful boost from the maple syrup (again, thank you Flavor Bible). If you want your berries to be further and fewer between, skip folding them into the batter and sink them, individually, with your fingers once you’ve portioned the batter into the wells. Note that this recipe also works with spelt flour, if you happen to have some around. If you go with spelt flour, I recommend a food scale so you can measure out 8 oz – it’s a little more dense than GF AP, and you’ll want slightly less than the 1 ¾ cups called for here. Spelt, for the uninitiated, is not gluten-free; if you swap it in place of the GF AP flour, you can’t feed these to your Celiac friends. If gluten isn’t an issue, I highly recommend playing around with spelt flour – it’s high in protein and has a lovely nutty, sweet flavor. Preheat the oven to 350. 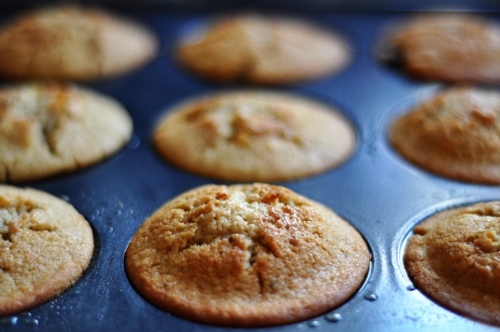 Prepare a muffin tin by lightly greasing the wells or lining with muffin papers. Rinse the blueberries in a colander and shake well to drain. Toss them in a small bowl with the maple syrup and give them a few good smooshes with the back of a spoon to lightly crush their little bodies. In a medium bowl, combine the flour, sugar, salt, baking powder, and cinnamon. Whisk the eggs, almond milk, and oil in another bowl. Gently fold the dry ingredients into the wet. 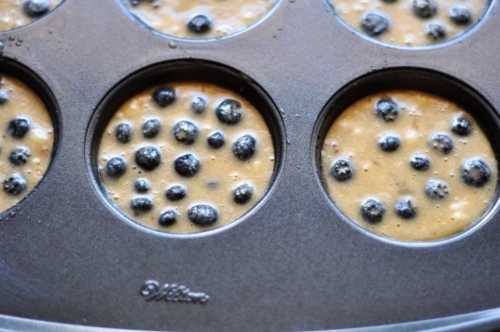 Fold in the berries with their syrup and gently stir until the berries are evenly distributed throughout the batter. Fill the wells of the muffin tin with batter (you should be able to get them around ¾ of the way full) and bake for 30 minutes, or until the tops are golden brown. Cool the muffins for 5 minutes in the pan, loosen with a butter knife, and turn them out onto a rack to finish cooling. Though you may be tempted to grab one and snarf right away, know that the berries will be like little orbs of lava if you dive right in. Sweet! I will have to make these for Janie, the Celiac. my goodness, this is a perfect post for me - besides my extreme obsession with almond milk (the brand I buy, Almond Breeze, has 40 calories per cup and is creamy as all gettup), i’ve been looking around for a recipe to make for a rly sweet teacher of mine who happens to be a celiac! This is PERFECT. I get to buy almond milk and make some yummy muffins AND give them to a celiac. You will hear not a peep of judgment from me! Go Bisquick go! Linsey and Dani - glad these will fill the bill. Oh, and just in case anyone is curious about the pictures, the top two are made with GF AP and the bottom two are made with spelt flour. Lovely, I am going to try these! I’ve never baked GF before (unless it’s custard or something like that), but it seems like a more healthful alternative. Thanks, Irene. This was my first real experience with GF baking as well, but I was very happy with the results. I know enough people who have gluten issues that it seemed like high time to start figuring out some ways to manipulate my repertoire to include things they can eat. Speaking of healthful, I’m toying with the idea of working some spent brewing grains (husband brews a lot of beer these days) into the spelt muffins to make Chuck Norris-worthy breakfast muffins. We’ll see - the spent grains are fantastically wet, which complicates using them. Btw, Irene - your pictures on your site are *so* lovely! Great blog, Bria, and gorgeous pictures! Do you take them all yourself? Thanks, alissa! I do take the pictures myself. I started out with a basic point-and-shoot Olympus but have since moved on to a very lovely Nikon D90 (I think the chocolate banana bread is the first post with pictures from the new camera). I’m still learning as I go, but it’s lots of fun. The Salty Spoon is powered by	WordPress 2.7 and delivered to you in 0.247 seconds using 24 queries.